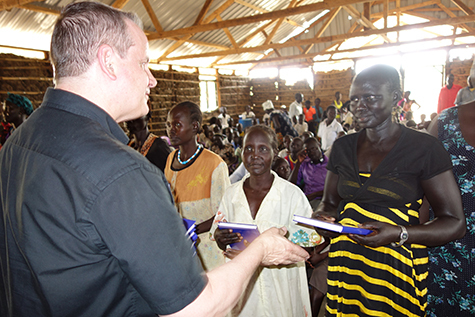 In Bor, South Sudan, where ethnic fighting has claimed the lives of hundreds, even thousands of Dinka civilians, God is bringing healing through His Word. After surviving clashes with rival tribes where families and friends were attacked, raped and murdered, Dinka Christians cling to the one thing that is steady and true: the promises of God. Their firm commitment to Scripture has led a group of former Episcopalians, under the leadership of Rev. Bol Nyok, to embrace sound Lutheran doctrine. Now for the first time, their pastors and parishioners have a statement of this faith in their own language: Luther’s Small Catechism, translated into Dinka by LHF. The SSELC recently began fellowship talks with the LCMS, and Rev. Bol is eager for their 19 pastors to begin formal catechism teaching to their parishioners. Now that the Dinka have the Small Catechism in their language, church leaders are eager to translate additional works that will help strengthen the Lutheran foundation that has been laid. As a new church body, the SSELC faces many challenges, especially in the area of finance, Rev. Bol said.